The Airbus Helicopters AS365 N3 Dauphin II is a twin-engined medium-weight transport helicopter powered by a pair of 851 hp Arriel 2C turboshafts equipped with a single channel DECU (Digital Engine Control Unit) with manual reversion, mated to an uprated main transmission for better single engine performance Turbomeca Arriel C2 Turbine engines, accommodating up to 13 passengers and 2 crew. The twin-engine SA.365 was developed in 1973 by SNIAS (Société Nationale Industrielle Aerospatiale) out of the single-engine SA.360 Dauphin. The SNIAS SA.365 prototype F-WVKE, a SA.360 fitted with 2 Turbomeca Arriel 1A Turboshafts, flew first on 24 January 1975. In 1977 production commenced with the SA.365-C, with deliveries starting in 1978. An improved version of the SA 365C Dauphin II, the SA.365N flew first on 31 March 1979. The SA365 N differs from the SA365C in having Arriel 1C turbine engines, a re-profiled fuselage, fully retractable undercarriage and increased fuel capacity in new under-floor tankage. Deliveries of the production model began in 1982. Deliveries of the AS.365 N2, equipped with two Turboméca Arriel 1C2 turboshafts, started in 1990. From 1984, SNIAS operated under the name of Aérospatiale. The helicopter divisions of MBB from Germany and Aerospatiale from France merged in January 1992 to form the Eurocopter Group. 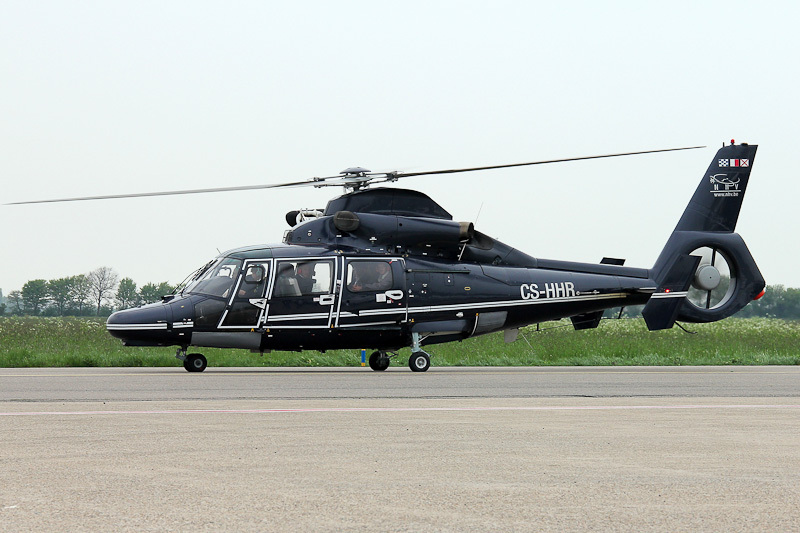 A new Eurocopter designation was added: EC 155 B1, originally known as the AS 365 N4. The Dauphin II is in use in several military and civilian roles. The AS 565 Panther is the military version of the Dauphin. The AS 366 G1, powered by two Textron-Lycoming LTS.101-750B-2 turboshafts, is used by the United States Coast Guard under the designation HH-65A Dolphin. The Dauphin II is manufactured under licence in China as the Harbin Z-9 Haitung and in Brasil as the Helibras MH-1. Already more then 1100 AS 365/366/565 and EC155 versions have been built. The ICAO Aircraft Type Designator for the AS365 N3 helicopters is AS65. On 5 February 2009, the 2009-built Eurocopter AS365 N3 c/n 6841 was registered F-OJTU in France with Heliportugal / Trabalhos e Transporte Aereo, Cascais, Portugal. On 19 May 2010, ownership of Dauphin II F-OJTU changed to Banco Espirito Santo SA, Lisbon. On 23 December 2010, registration F-OJTU was cancelled as exported to Portugal. On 7 February 2011, the AS365 N3 was registered CS-HHR with Heliportugal as operator and Banco Espirito Santo SA, as owner. On 8 July 2011, Dauphin II CS-HHR was delivered at Ostend, Belgium, for a lease to Noordzee Helikopters Vlaanderen initially from 5 July 2011 to 5 February 2012, but the lease period was extended. On 2 May 2012, Dauphin II CS-HHR was seen in service with NHV – Noordzee Helikopters Vlaanderenat Rotterdam The Hague Airport, Netherlands.